If you participated in any of the recent Fallout 76 beta sessions, you're eligible to take part in the "Play With Friends" program Bethesda announced today. 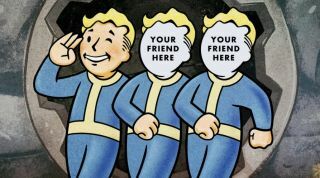 Through it, you can grab up to three extra beta keys that you can give to your friends so they can join you in the next Fallout 76 beta session. Per the program's official FAQ, as long as you logged into the beta or redeemed a pre-order code, you'll have three friend keys waiting for you in the transaction history tab of your Bethesda.net account. These keys are platform-exclusive; if you played the beta on PS4, for example, you'll only be able to grab PS4 codes. In case there's any confusion, you can tell the codes apart by their format: PS4 codes are 12 characters, PC codes are 16 characters, and Xbox One codes are 25 characters. If you're on the receiving end of a friend's beta keys, you can redeem it via Bethesda.net, the Microsoft store, or the PlayStation store, depending on your platform. Once you redeem your key, you'll be able to join in all upcoming beta sessions. The next beta session is scheduled for tomorrow, November 3, from 5pm to 9pm EDT / 2pm to 6pm PDT / 10pm to 2am BST. There's also another beta coming on Sunday from 2pm to 9pm EDT / 11am to 6pm PDT / 7pm to 2am BST. These are the last two sessions that we know of, but more may well crop up between now and Fallout 76's November 14 release. Fallout 76 is just weeks away: here's everything we already know about it.